Over the past six months, my tarantula collection had grown a great deal in both the quantity of Ts kept and the size of individual specimens. I now had several adult/sub-adult Ts that required larger prey items, and I was looking for an alternative to the crickets. I decided that it was now time for me to start raising my own food source. So, a couple months ago, I purchased my first dubia roach starter colony of 125+ roaches. After doing some online research on dubia husbandry and breeding in which I discovered dozens of enclosure designs and roach-chow recipes, I was ready to set up my own colony. What follows is what I have come up with to house and feed my roaches. This is, by no means, the only way to do it, nor can I take credit for coming up with these designs or methods. This is, however, what is currently working for me. I picked up my 7 gallon Sterilite at my local Walmart. You can definitely use a larger size of container, and many do, but I needed something that would fit comfortably on a shelf that I already used. 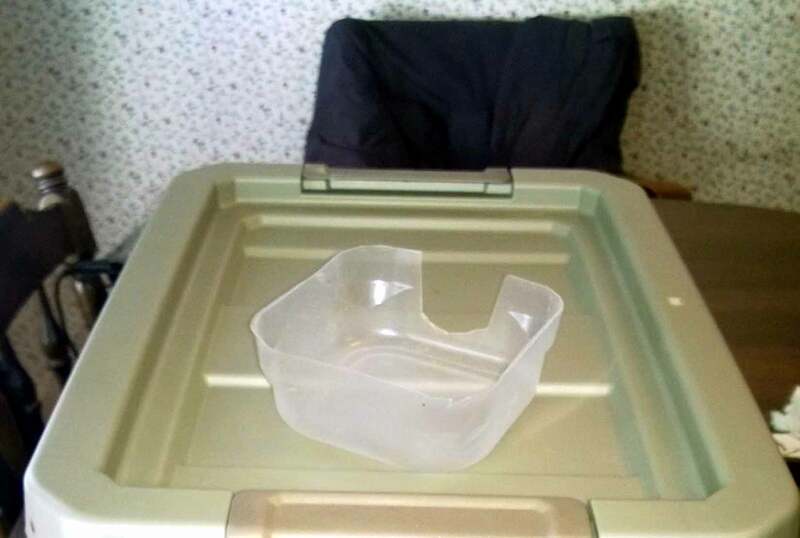 Although these containers are offered in clear plastic, you want something that blocks most of the light out (roaches, as you may know, are NOT fond of the light). UPDATE 11/2016: My colony grew rather quickly, so I now use a 58-quart Sterilite container. 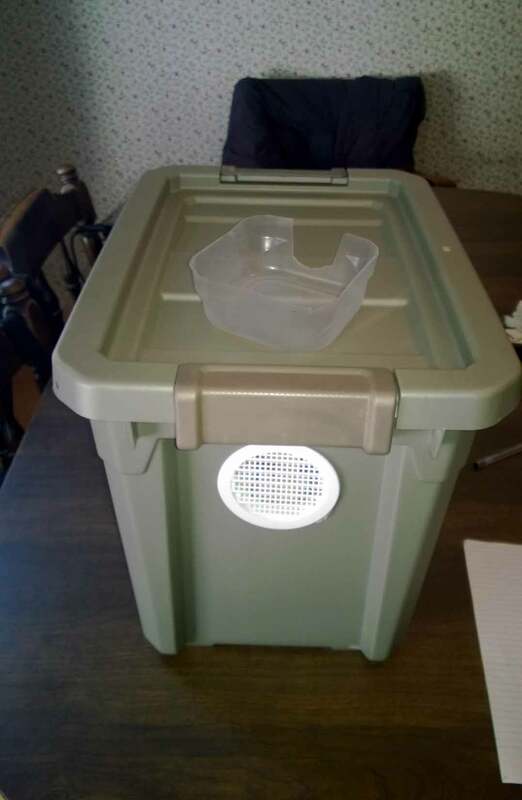 I found this to be a great size for my roach colony enclosure. I always have some of these convenient plastic vents on hand from Round Vents , so I used them for my enclosure. These 3″ vents only run $1.32 each, and I find cutting two holes to install the vents MUCH easier and faster than drilling dozens of air holes. However, either way would work. 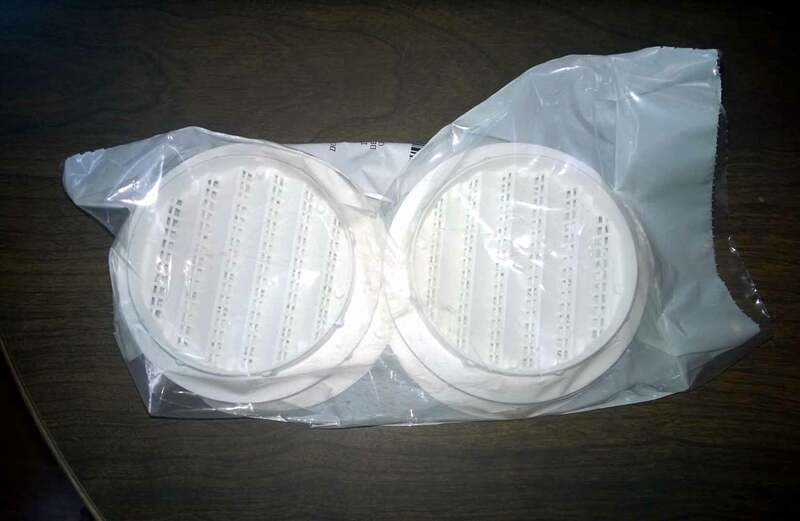 3″ white plastic vents from Round Vents. To install them, I just used a 3″ hole saw and my cordless drill to make a hole on either side of the container. I used hot glue around the edges then just popped them in. (Again, you can drill a series of holes, and it will serve the same purpose and cost a bit less). The vents have been installed on opposite end of the Sterilite enclosure. Vents should be close to the top. You’ll need something inside the enclosure for the roaches to climb on and hide in. 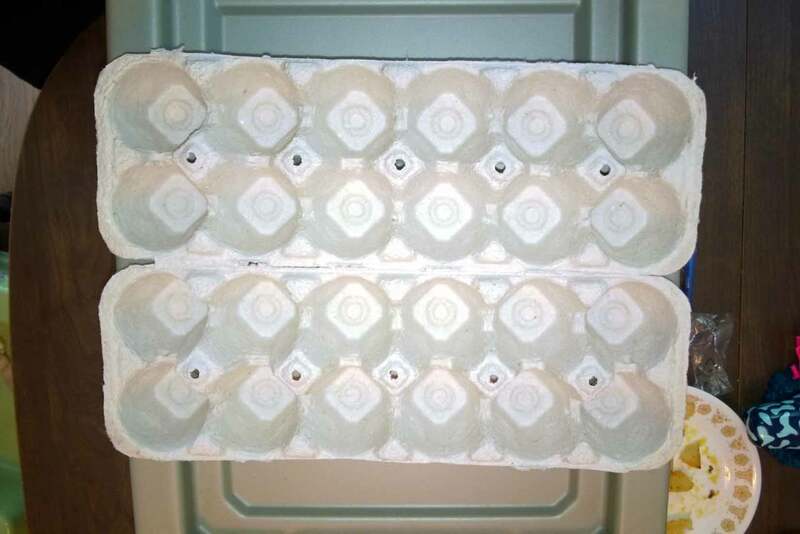 Cardboard egg cartons or egg trays work perfectly. If you have the forethought (and you eat a lot of eggs) save some of the ones you get when you buy eggs from your local grocer. You can also find them at tractor or farming supply stores. I bought mine at a local Agway. Many use the 6 x 6 egg trays, but for my smaller enclosure, the regular 2 x 6 egg cartons fit better. The larger trays can be purchased in bulk online. Put these inside your enclosure for the roaches to climb on and hide in. Roaches need food bowls, too. It makes it MUCH easier to clean and feed your roaches if you supply food bowls. For mine, I used two Ziploc small square containers (5″x 5″), which I trimmed down with a pair of scissors to fit better and to add an entrance for the smaller roaches. 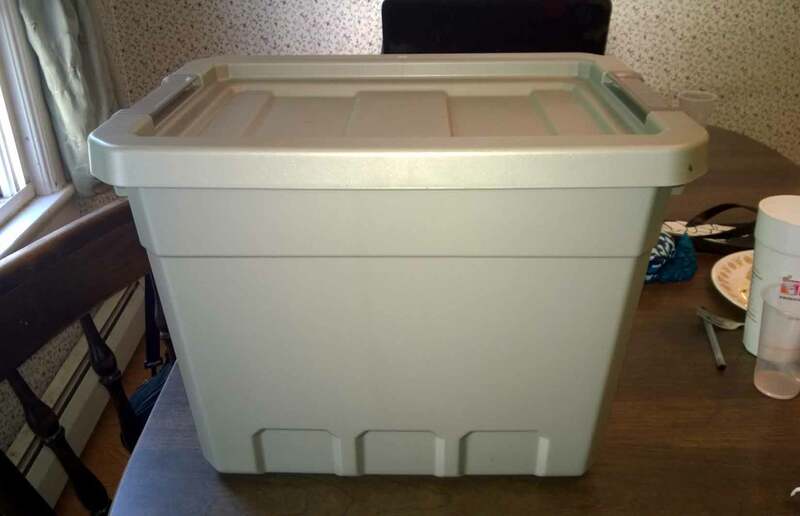 One of these I fill with fresh organic fruit (nectarines, oranges, peaches, strawberries, grapes, apples, etc.). The other I fill with my homemade “roach chow”. Two of these are supplied: one for fresh fruit and the other for the dry roach chow. Carefully fit everything into the enclosure. On one end, stand up the egg cartons. I have two rows of five in mine, and the roaches seem to do fine. At the other end, place the two food bowls with the openings facing the egg cartons. 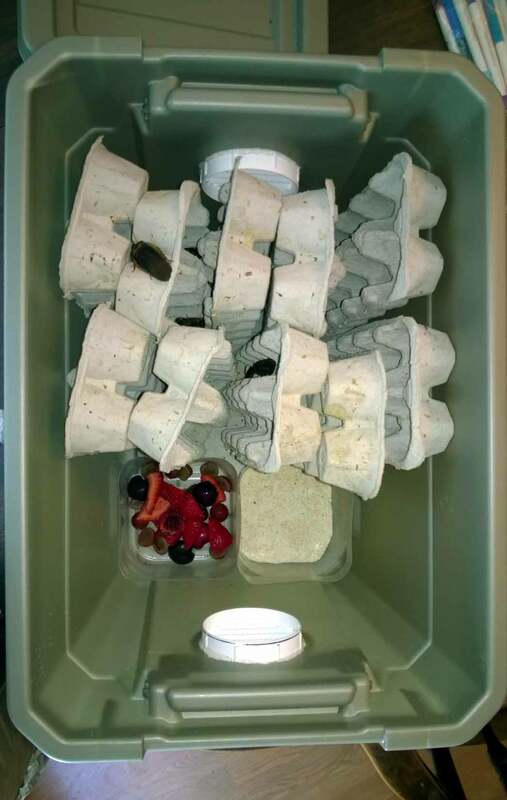 When you get your roaches, carefully dump them on the egg cartons; they will quickly scramble down between them to hide. The roaches will climb and hide in the egg cartons. The two food bowls contain fruit and roach chow. A word about roach food. It’s a fact: roaches will eat just about anything. As a result, there is no set, scientific diet for your feeder roaches. Do a quick search online, and you’ll find dozens, if not hundreds, of possible food choices. Moistened dog food, chicken mash, crushed cereal, organic tabbouleh…all are on the menu. While researching, I stumbled upon this cheap, simple recipe for “roach chow”, and so far it’s worked great. There are only two ingredients. Goldfish flakes and whole oats combined and blended make great roach food. Just drop the oats and flakes in a blender (I do about 60/40 oats to flakes), blend to a powdery mash. Simple. I purchase large canisters of both, then blend up extra so that I always have it on hand. 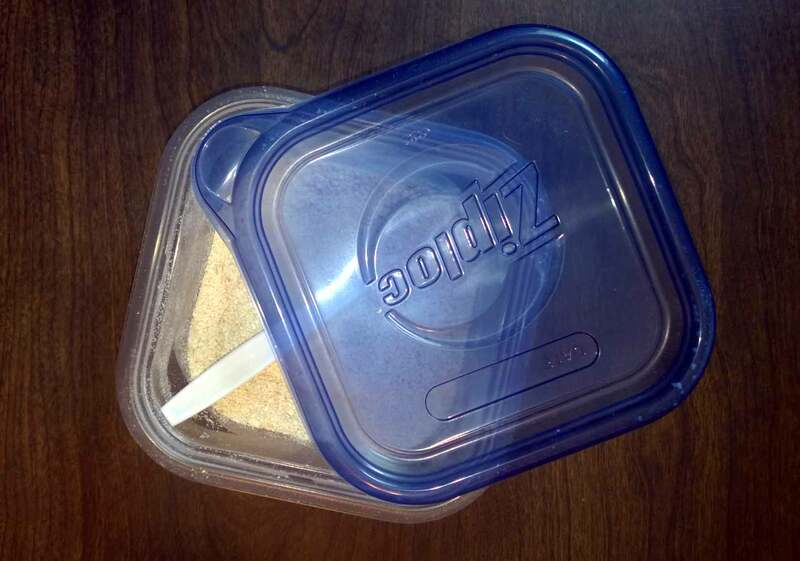 As both the flakes and oats can be purchased at Walmart for a few dollars, you can make enough food for months without hurting your wallet. I supplement the roach chow with fresh fruit to provide a more balanced diet. For water, I spray down one side of the enclosure just above the fruit dish every night, which has been fine and keeps things from getting too moist. UPDATE 11/2016: I have altered my roach chow recipe a bit. 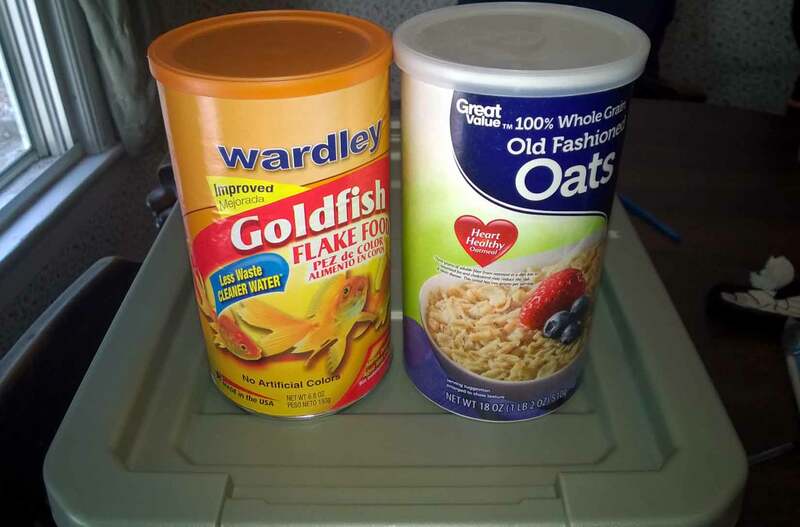 I now use oats, corn meal, and fish flakes in a 40/40/20 ratio or so. I drop these in a blender, grind them up good, then store them in an airtight container. I also don’t offer fruit as often anymore, as it spoils very quickly (especially during the summer) and attracts fruit flies. I’ve switched to mostly carrots, potatoes, and some apples. My container of “roach chow” (blended oats and fish flakes). If you want happy roaches and an ever-growing supply of feeders, you’d better be prepared to jack up those temperatures. Dubia thrive in warm environments. and you’ll need to keep them in the mid 80s to mid 90s if you’d like them to mate and reproduce. As these temps are too high for many T species, you will likely have to keep your feeders in a separate room. During the dog days of summer, I keep mine in my attic, where temps are almost always around 88-90 degrees. UPDATE 11/2016: They do not need temps in the high 80s to low 90s to reproduce. Mine are kept much of the year in the 70s, and they still have young. That said, you get more offspring the warmer you keep them. If you can’t get your room temperatures up high enough to stimulate faster reproduction, you can use a heat mat on one side of the enclosure to raise temps inside. If you’re using a Sterilite bin, try mounting the heat mat on a wall, then position the cage next to it. Keep in mind that high temperatures will cause fresh fruit to rot very quickly, so be sure to change the fruit bowl often to avoid fruit flies and decomposition. In the winter months, they should really be kept 65-70 minimum. However, although this will be high enough to keep them alive, they will not be reproducing. My wife and I clean our colony every week, and we’ve found that it’s quite simple. Just lift out the egg cartons and place them in an empty cardboard box while you work. Remove the food dishes and any stragglers, then just dump the feces (which is tiny and dry) into the garbage. Use a damp cloth to clean up the bottom, dry it, then put everything back in. They are actually quite clean overall, and produce no real odor. So, there you have it. Again, this is not the only way to keep roaches, but this is how I’m currently keeping mine. It is also quite inexpensive to put together, costing around $20 for everything. However, feel free to experiment or do whatever works for you. Dubia, generally speaking, are quite hardy and will adapt to other food sources or set ups. Could you please explain exactly what becomes toxins and how this kills the roaches/tarantulas? I’ve been using this combination of mostly oats with fish food for a while now, supplemented by fresh organic fruits and vegetables, and I’ve had no issues with either roaches or tarantulas dying. Also, why would the dog food be poisonous? Obviously, you have some knowledge in this area, and I really love to hear it. I’ve never heard this before and I’m very curious. What do you feed your roaches? She is probably referring to Uric acid build up in the roach’s body due to high protein. With a 60/40 mix of fish flake/oats with protein values of 38% and ~9% your final mix is sitting at around 20% protein. That is on the higher end of the spectrum, but not by any means excessive given they have carbs and other nutrition in the form of vege and fruit matter. As long as roaches have different food options they have the ability to self regulate their intake, and his roaches will be fine Those feelers they comically fling around have a purpose. This is an older post and I’m curious as to any evolution in your feeding techniques. I ask as I use dubiaroach chow and carrots as the veggies primarily, but have shifted to an oats and cornmeal mix as an alternate feed as my lat and dubia colonies are eating me out of house and home. If I stick with just the commercial feed, I’ll be spending far FAR more than I want to. Yup, I definitely have to do some updating with this one! I have a running list of topics I have to revisit (including an update of the best beginner species). I moved away from offering most fruits, as it would get nasty in a hurry and attract fruit flies. I now use potatoes, carrots, and the occasional apple for the produce. I use these for the Dubia, lats, and hissers. Per your suggestion, I bought some Roachchow from Dubia.com, and I really liked it, but I burned through the bag I bought much too quickly (plus, after my last horrible experience with them, I won’t be ordering there again). So, I went back to my own mix. I switched to using oats (I get the big tubs at wally-mart) some fish flakes (not as much as I was using), and corn meal (as it’s cheap). Billie blends it all up for me, and I have a couple tupperware containers full of it. I’ve been feeding some version of this for years now, and I’ve had no issues. It’s also quite cheap, especially if you buy the large containers of the ingredients. I generally feed them the dry food once a week or so (or when I notice it getting low) and change the produce out twice a week or so. When I notice that the food is going to fast, I use that as a cue to tell me it’s time to thin the herd a bit. So, I’ll feed a bunch out. How many do you have now? Maybe you could start selling them? My dubias I leave to their own devices…I haven’t had the heart to feed em’ out since I saw Mom taking care of her young. –sappy, I know, and I will start using them again once my LP’s get big enough, but my big guys (4-6″) all seem to be thriving on 2 lats every five days, so my B.dubia are living out their lives peaceably. heh. That’s the thing; I have over 170 things I can feed with them at any given time. I never let them get to the point where they’re reproducing faster than I can keep up with. When I saw the food bowl going down quickly over the summer, I did a couple mass- feedings and thinned the herd by several hundred to a point where they had to build back their numbers again (in fact, I went a bit too crazy last winter, and it took them a while to build back up). They’re roaches, so they are masters at reproducing. I have a lot of people that email me about starting roach colonies when they only have a handful of spiders. I try to warn them that they are likely going to end up with a surplus that they will then need to deal with. If you ever feel like packing some lats up and selling them, let me know! I’ve considered letting my colony explode, and then selling them off in batches cheap. I just have so much going on between work and my pets that I don’t know if I want the bother. brain fart…derp. Yeah, that’s a great idea. I DO have heat pads under both on a thermostat that keeps the temp in one corner of each enclosure in the mid 80’s. Without the pads, the temp will settle back to 72-74 degrees. I’m actually thinking of setting up a dubia “display” case and set it up for observation with a red lamp as I do my T’s. The dubia have really grown on me….metaphorically. heh.